1975 Bob Dylan Rolling Thunder Revue concert ticket stub. 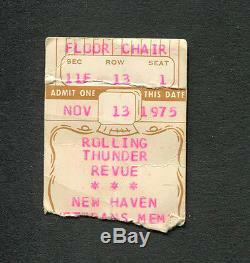 November 13, 1975 - Veterans Memorial Coliseum, New Haven, CT. Approximately 1 1/2 x 2 inches. Our inventory consist mostly of one of a kind items that we do not have extras of, so when they are gone, they are gone! The item "1975 Bob Dylan Rolling Thunder Revue concert ticket stub New Haven CT Desire" is in sale since Friday, February 12, 2016. This item is in the category "Entertainment Memorabilia\Music Memorabilia\Rock & Pop\Artists D\Dylan, Bob\Other Bob Dylan Memorabilia". The seller is "novakent" and is located in Las Vegas, Nevada. This item can be shipped worldwide.